Combining the dry ingredients. Combine the flours, ground ginger, ground cinnamon, baking soda, sea salt, nutmeg, cloves, and black pepper in a large bowl. Whisk them all together to combine and aerate. Combining the wet ingredients. In the bowl of a stand mixer (if you have one), mix the shortening and sugar together until they are well combined. Scrape down the sides of the bowl, then add the egg and mix for a minute before adding the maple syrup, malt/molasses, vanilla, orange zest, and fresh ginger. Scrape down the sides of the bowl again and run the mixer on low speed until everything is combined thoroughly, about 2 minutes. Finishing the dough. With the stand mixer running on low, add the dry ingredients, about ¼ of it at a time, mixing in between until the flour has disappeared entirely into the dough. Continue this until all the dry ingredients have been added. The dough will be a little sticky to the touch. Don’t worry. Refrigerating the dough. Divide the dough into four pieces. Wrap each in plastic wrap and put them in the refrigerator. Chill the discs in the refrigerator for at least 1 hour or up to 3 days. Or just refrigerate it all in a covered bowl and use a knife to cut into four manageable pieces for rolling. Baking the cookies. When you are ready to bake the cookies, preheat the oven to 350°. Roll out the dough, to about 1/4-inch thick. You can either toss a little buckwheat flour on your rolling pin and counter/Silpac or roll between 2 pieces of parchment. Cut out the cookies using your favorite gingerbread man cookie cutter. Gather up all the scraps into a ball and roll out with the next batch of dough. 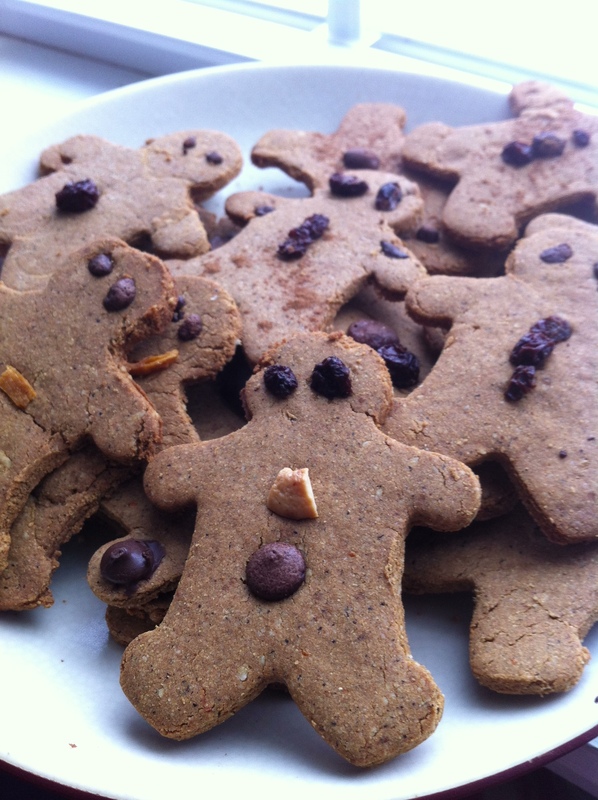 After the last gingerbread men are cut out, throw the random shapes onto the baking sheet and cook them up. Decorating the cookies Before putting them in the over, decorate the cookies with raisins, chocolate chips (I cut them in quarters so they would be better sizes for eyes), nuts, dried fruit or anything you like. Bake the cookies until the centers are firm to the touch, about 15 minutes. This entry was posted in Desserts, Recipes and tagged Gluten-free, kid-friendly. Bookmark the permalink. Both comments and trackbacks are currently closed. Could I substitute the palm shortening for coconut oil? I think coconut oil would work fine instead of palm shortening. If you try it, let us know how it went. Also, butter would be great, I am sure.